And introducing...The Flour Gurl. Yes, that's me - your personal guide to gluten-free living. I am now providing real-life gluten-free tutoring services.....not just through a screen! The name of my blog will not change, it will just be 'Gluten-Free Musings" by The Flour Gurl. But now, I will be doing much more than just having a blog. I want to put a name with what I have been doing for years...directly helping people navigate the world of gluten-free living. This can be overwhelming and daunting to someone new to this way of life. For someone who is newly diagnosed, has a child who is newly diagnosed, or having to accommodate gluten-free guests, this can seem downright isolating and impossible. I remember how I felt when I was diagnosed 6 years ago, when the doctor's nurse told me casually over the phone that I tested positive for celiac disease. It sent me in a whirlwind of emotions, I felt like the bottom had just been taken out from under me. I felt completely alone. I was in disbelief, I was in anger, I was in denial, I cried....a lot. For all the details, read here. My goal is to help people, who are new to the gluten-free diet, navigate the overwhelming world of gluten-free living, as a tutor would help a student learn French. Being new to the gluten-free diet really is like learning a new language. One has to relearn how to approach food, dining situations and even personal care products. I am not a doctor, nor do I have any medical training, but I live the life 24 hours a day, 7 days a week, with absolutely no exceptions. I really look forward to this new adventure and working with those new to the gluten-free lifestyle. Please email me at anne@theflourgurl.com to set up an appointment, and for current rates. I find baking a fun challenge, especially baking gluten-free. There is something about baking that is thrilling when it is my first time trying something. It is like I want to be able to prove that I can make something amazing, specifically when it is gluten-free. You know the reactions you get at parties after you divulge the piece of information that you are gluten-free....either people feel bad for you, or people don't believe you, and just roll their eyes at you, or they even try to explain why it isn't really necessary. And that's ok. You know why....because people will be so shocked with how good these little bite-sized treats are, they won't care if you are gluten-free or not, they will just want more! I got the idea to make the pumpkin truffles after a neighborhood children's Halloween parade. There was a bake sale, and while I usually don't even approach the table, because I know I am not going to be able to eat anything, I decided to take a look, and I saw some adorable little cookie pumpkins. It listed the ingredients, and while it looked safe to eat, I decided not to risk it, but couldn't wait to look it up when I got home. The closest thing I could find were Brazilian brigadeiro, which are little truffles popular at Brazilian parties. I couldn't wait, I had to try them that night. The ingredients are simple - sweetened condensed milk (one of the greatest inventions ever! 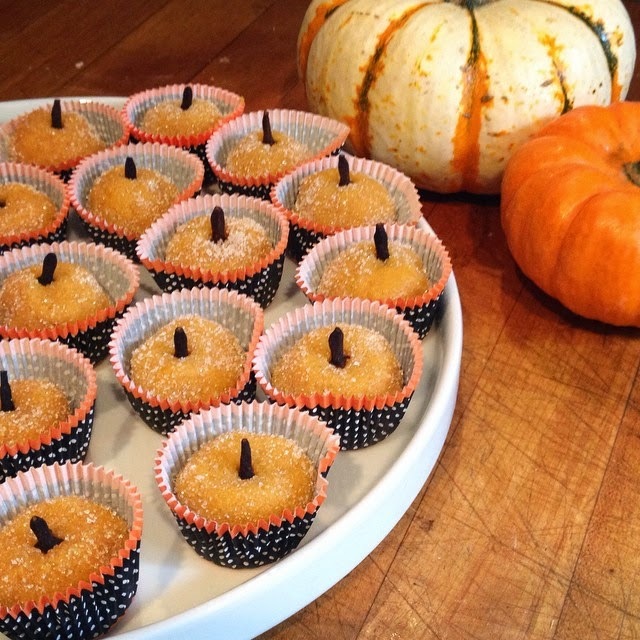 ), pumpkin, butter and sugar. And, wow did they taste delicious. It is impossible to stop at one. They are the perfect treat to bring to a party! I couldn't stop there. With the holidays around the corner and my love for peppermint, I was determined to make a wintery equivalent. 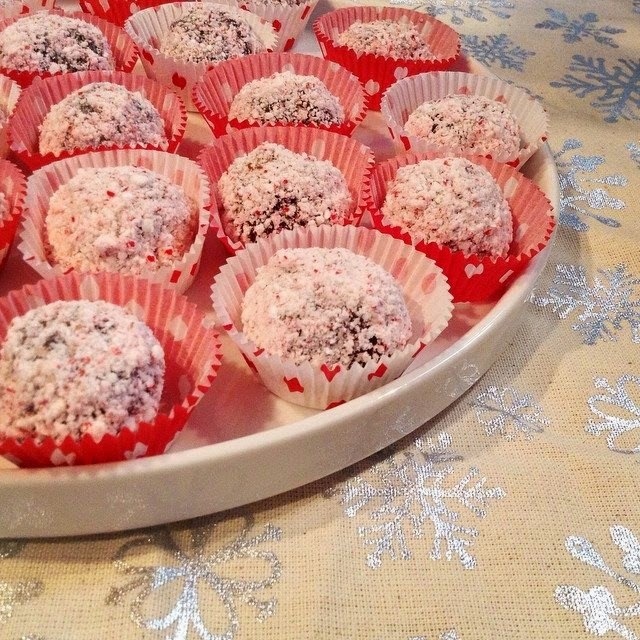 One key thing to keep in mind while making these truffles - you must stir! And not stop. So, put on some good music, a good TV show - you will be stirring until they are done. It doesn't take long, but you can't walk away. Don't walk away! You don't want any stickage on the bottom of the saucepan. Just keep stirring, and you will be pleased you did. Place in small paper candy cups. These are just 3 examples, but I think it would be really fun to try out different toppings - coconut, almonds, pistachios, pretty sugar toppings, the possibilities are endless. Making an assortment over the holidays would be a great teacher or hostess gift. Or, if you are really brave, have a truffle making party with friends! Candy Cane sugar. It is the condiment of the holidays, and can be used on so much...hot chocolate, cookies, peppermint bark, sprinkle it on popcorn, ice cream...I mean really, peppermint is pretty good on a lot of things! 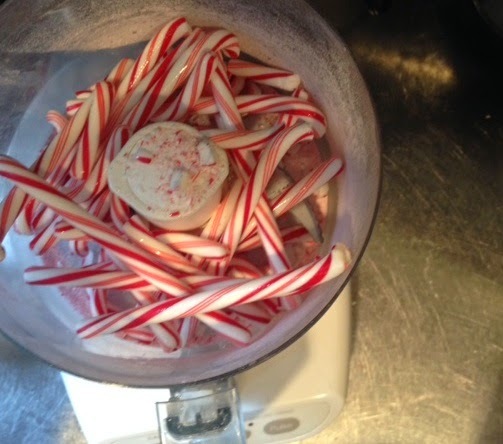 It is so simple that I am going to make this post just as simple as candy cane sugar. You buy old school red and white candy canes. Put the "sugar" in a well-sealed jar. Any moisture will make it all stick together. Start adding it to everything! Who doesn't like easy and yummy? I am all about easy and yummy! And here it is - refrigerated oats....there is no cooking involved....no cooking! How does this work? Just mix a few items together, let them sit overnight, and viola! You have breakfast, a snack, or even dessert ready to go! I have really enjoyed these over the summer, but I will definitely continue to make these year-round. I can't take credit for being the mastermind who came up with this sensational jar-sized snack, but as usual, I look at a bunch of recipes, and come up with my own. These are individual 8-ounce servings, and work perfectly in small Ball jars. I choose the plastic ones, they are cute, and I can take them to the pool. You can buy plastic lids that fit specially on the glass version which is nice too. I like preparing these at night, and then they are ready the next day as soon as I need a snack, and before I go for a handful of chips. I like that these are full of fiber and protein, so they keep me going for a couple of hours. Being gluten-free, and for the most part vegetarian, it can be really difficult to get protein throughout the day, and this solves that question. 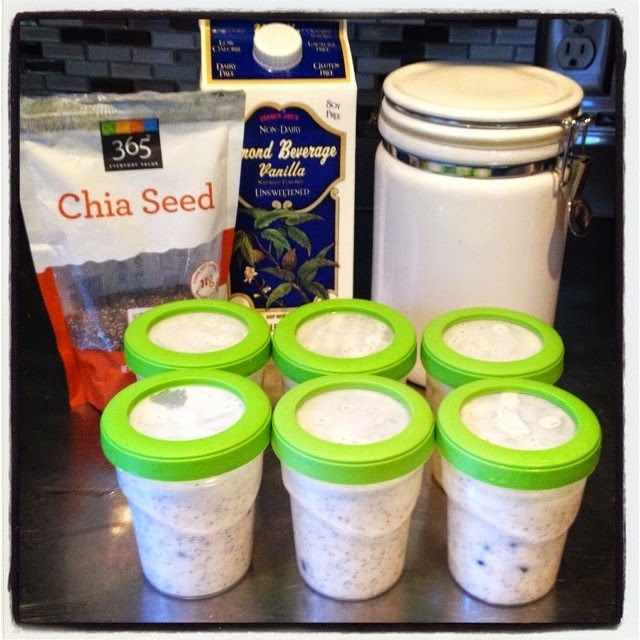 One ingredient I love is chai seeds, one of today's "superfoods". They act as a thickener and are full of nutritious fiber and protein. And let's not forget, two words....chia pet. Place in the fridge overnight, and enjoy the next day! I like to make several at once, and leave them in the fridge up to 3 days. This post isn't necessarily targeted just for those who are gluten-free, this little tidbit of advice is applicable to anyone who likes omelettes - like me! I like to consider myself pretty decent in the kitchen, I can usually make things happen with yummy results, but I have never been able to master an omelette, it would always turn out to resemble more of a ....scramble, after trying to cook it forever on the stove. I could never get one to stay together and look like they do in a restaurant. It really was a complete mystery to me. I can make a pavlova work no problem, but an omelette, that was apparently beyond my capabilities. Then the other day, I heard a secret and I will share it...because it was miraculous, and best of all...it worked! I made an omelette (pictured above), that actually stayed together and I wouldn't be embarrassed serving to guests. I guess all of these years I have been doing it wrong...I would whisk two eggs with some milk, and the result was never pretty. The secret ingredient - sour cream. I would never have thought of it, but it worked. I whisked two eggs with a spoonful of sour cream, poured into a heated omelette pan, added my toppings, which happened to be spring onions, spinach and Parmesan. It flipped easily and came out of the pan in one piece. It was guest-worthy! I would take a guess that Greek yogurt would work just as well as sour cream. It might seem silly to have an entire post dedicated to the worthiness of an omelette that can remain intact, but being that I didn't know how to do this until I was 40 (ok, 41, but who's counting), is a pretty big deal in my book.